Raise your hand if you own a cookie scoop for baking your favorite recipes. Just acquired one of these little beauties last year, and I don’t know how I ever lived without it. I have been baking for a long, long time, and I have always used the two teaspoon method to measure the cookie dough onto the cookie sheet. Now I do need to point out that this cookie scoop method only works for your fave recipes that are in the category of “dropped” cookies. Meaning you just toss the dough onto the cookie sheet to bake. 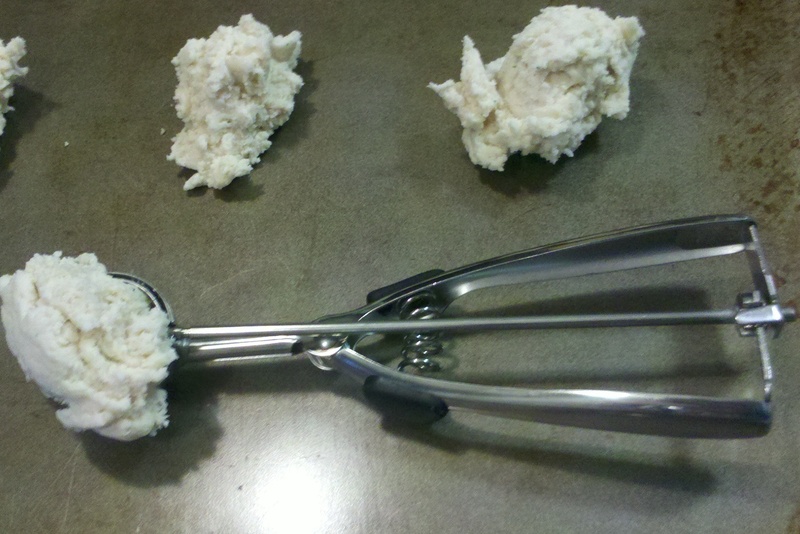 The dropped cookie method just seems so old school now that I can just whip out my cookie scoop and go to town. It is amazing how you can plop down consistent scoops for an entire cookie sheet in no time at all. It makes me feel like I’m my own little “Mrs. Fields” cookie establishment. And I recently discovered (just this week actually) that I can use this sweet little scoop for making my Bisquik biscuits. Yipee!! As you start going through your favorite cookie recipes for the holidays keep in mind that the cookie scoop can be your best friend for mass baking. And they do come in different sizes for cookies, meatballs, biscuits,etc., etc. So everyone get out your recipes and go to town. Cookie fest here we come! Hey, I recently acquired a cookie scoop as well! (Thanks Auntie!) I use mine for measuring cupcakes! slightly underfull scoop for mini cupcakes, heaping, plus a bit, for regular size! 😀 Love it!